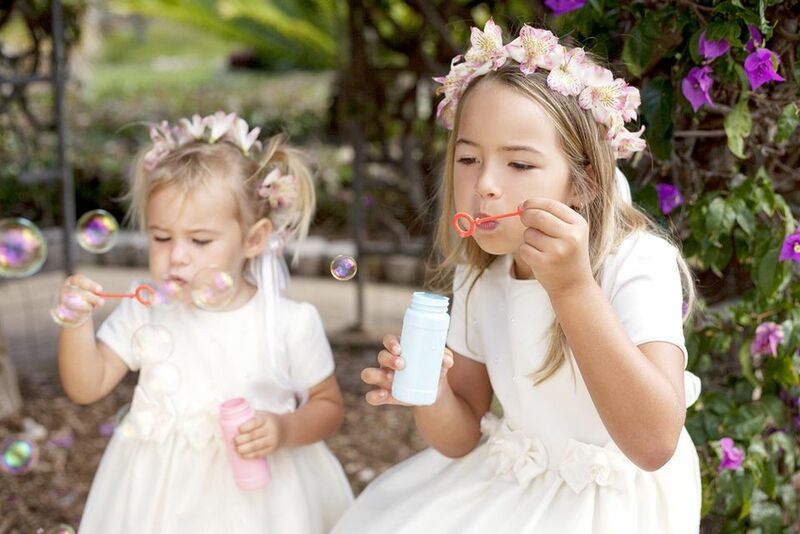 If you have children from a previous relationship or have other young family members, you might consider making these kids a part of your wedding ceremony. There are many meaningful ways for a child to be included. But since kids can be unpredictable, you'll want to make sure they are playing an appropriate part for their age, and that you've done everything you can to make them comfortable. They will wear an outfit similar to the other members of the bridal party, and fulfill many of the same roles as they do. They need not attend bachelor/bachelorette parties or showers. They will read a passage about marriage or love during the ceremony. There's no reason why your child can't be the one to walk you down the aisle. They will help guests to their seats, pass out programs, and do everything the other ushers do. Children might not do everything you think they will during the ceremony―it won't be perfect but it will probably be cute and entertaining. Our favorite story is the one where the little boy takes the rings up the aisle, but every few steps he turns around and makes a ferocious face and growls at the crowd. The crowd laughs hysterically but no one understands. Later, when he's asked what he was doing, he seriously answers, "Being the ring bear!" Assign them a helper―ideally another member of the wedding party who can keep an eye on them, hang out with them before the ceremony, and take them outside if they start to cry. Bring a change of clothes for the wedding reception―this way they can eat, run around, play with crayons or other toys, all without fear of ruining nice clothes. Practice walking down the aisle, until they are comfortable with it. Consider buying them a book that talks about being a flower girl or ring bearer. For a child whose parent is getting married, be sure to include them in the ceremony. This may mean asking the officiant to mention their names several times, or it may mean doing a family medallion ceremony, unity candle ceremony or ring ceremony that will include them in the new family that is being created. You could also include the children in your vows to each other. Having a part to play in the wedding ceremony can often make a child feel less anxious about the marriage. Whatever you do, be sure to be patient with children. They may get suddenly shy, or uncomfortable with what's going on. In the end, let them do as much as they are happy doing.